June 2010 UK car sales were up 10.8% on June 2009, with first 6 month sales up 19.9% on 2009. The Vauxhall Astra was the surprise best seller, now looking set to outsell the Focus by the end of the year, with the Focus now on runout. New car registrations climbed by 19.9% in the first half of 2010, up by over 180,000 to 1.1 million units. Volumes in the latest quarter were up 11.8%. June 2010 recorded the 12th successive monthly increase, despite just 0.7% of registrations coming from the scrappage scheme, compared with 19.2% during the same period last year. This June was 16% above the level forecast by SMMT in April, but was 8.5% off the 1999-2009 average. The fleet market rebounded in June, up 25.3% on the volume recorded a year earlier, whilst business volumes rose by 18.4%. Private demand was almost unchanged, down 3.3%. Over the first half of the year private demand has shown the largest rise, up 24.6%, boosted by the scrappage scheme. The scheme closed to new orders in March. Alternatively fuelled vehicle (AFV) registrations matched their largest ever market share, at 1.2% in June. AFV volumes rose by 157.4% in the month and have grown by over 150% in four of the past six months. The rise in diesel sales helped sustain total market growth. The Nissan Qashqai was the best selling diesel in June. 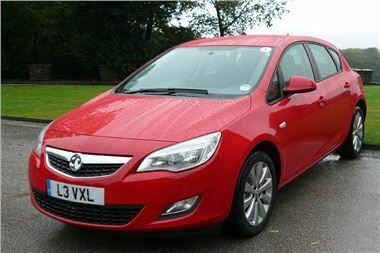 The Vauxhall Astra was the best selling model in June, its first number one slot since February 2008. Ford’s Fiesta had the highest registrations over the first half of 2010. With the exception of the mini and executive segments, growth was evident across the board. The strongest rises were in the MPV, luxury saloon and lower medium sectors.